Your Support Makes WGXC Possible! Your financial support is tax-deductible, allows WGXC to meet the most basic operating costs, and keeps WGXC on your FM dial. 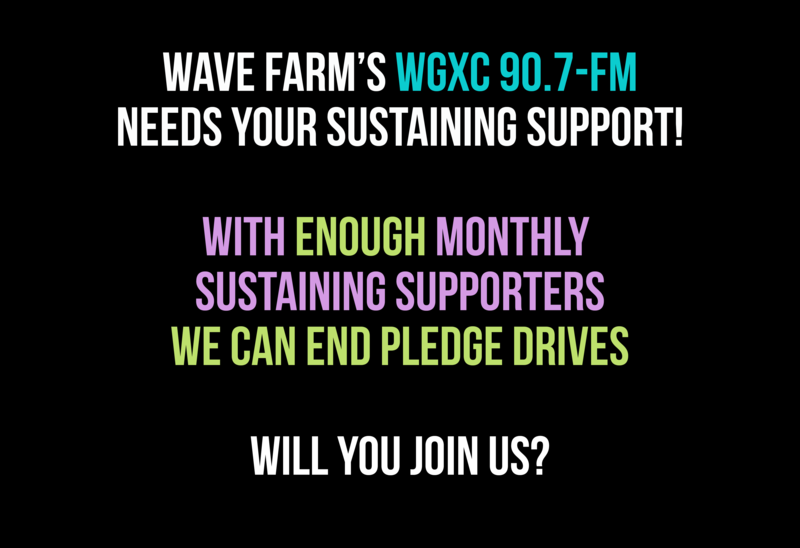 Financial support through donations, underwriting, and merchandise sales, allows Wave Farm to meet the most basic WGXC operating costs, and keeps creative community radio on your FM dial! WGXC is a program division of the 501(c)3 non-profit arts organization Wave Farm, and your contributions are tax-deductible to the full extent of the law. Make a one-time donation or become a monthly sustaining supporter by using the buttons to the right. Mail to: PO Box 13, Acra, NY 12405. WGXC is now able to accept donations of stock. With a charitable gift of appreciated shares held long-term, the donation you make and the deduction you get are greater than they would be if you were to instead sell the shares and donate the cash proceeds. This is because when you donate shares, you avoid paying the capital gains tax. For more information about making this type of donation to Wave Farm’s WGXC, please contact Galen Joseph-Hunter galen [at] wavefarm.org or (518) 622-2598. Why underwrite with WGXC? Underwriting is a unique opportunity to reach WGXC’s 78,000 potential listeners on 90.7-FM, and thousands more who regularly visit wgxc.org. WGXC’s listeners believe in the importance of local media, and support the local businesses and organizations that support us. Our listeners are engaged and informed consumers. They value and recognize the investment made by local and regional businesses and organizations in support of community media. What is underwriting? Underwriting is a specialized and non-commercial form of advertising. These on-air announcements are broadcast at the top of every hour, 24 hours a day. The content and broadcast schedule of these announcements must comply with FCC regulations, and are drafted cooperatively by WGXC and each underwriter. WGXC will recognize your support throughout the day and week, during a diverse selection of music programs; cultural and arts programs; local, national and international news programs; and public affairs programs. Plus, your logo will be displayed at wgxc.org for the duration of your sponsorship. On-air announcements to get word out in the days leading up to your event. Your organization or business logo will be displayed at a highly visible location at wgxc.org, and link directly to your website or Facebook page. * Non-profit discounted rates available. Click here for WGXC's current Underwriting packages and pricing. To become an underwriter or for more information, contact Station Manager Lynn Sloneker lynn [at] wgxc.org or phone (518) 697-7400. Wave Farm's WGXC-FM is made possible, in part, by donations from generous individuals and businesses who are Friends of WGXC. We hope you will join us. Peter Aaron (Kingston), Linda Allen (Portland, OR), Katherine Ayars (Poughkeepsie), Nancy Barber and Bill Stone (New York), Basilica Hudson (Hudson), Katherine Bauer (Hudson), Audrey Berman (Germantown), Bill (Cairo), Bodhi Bridge Music Stone Mountain Sound Motion (New Paltz), Peter Bohn (Gilboa), Christina Bohnsack (Germantown), Dave & Sheri Bolevice (Philmont), Stuart Breslow and Anne Miller (Catskill), Matt Bua (Catskill), Carol (Hudson), Emily Chameides (Hudson), Michael Chameides (Hudson), Mary Chatham (Hudson), Chez Masterson (Columbia County), Claire (Acra), John Cleater (Columbiaville), Daisy (Kingston), Charlie Doheny (Philmont), Don and Ginna (Rhinebeck), Brendan Donegan (Hudson), Stuart Dorris (Hudson), Ellen (Medusa), Maura Ennis (Guilford, CT), Victora Estok (Beacon), eteam (South Cairo), Ben Ezinga (Hudson), F+B Construction (Germantown), First Hudson Mortgage (Hudson), Nassau Supervisor David Fleming , Bryan Fox (New York), Peter Frank (Hudson), Chris Funkhouser (Rhinebeck), Ralph Gartner (Valatie), Rob Gelles (Hudson), Gladys , David Goren (Brooklyn), Phoenix Grace (Delmar), Phoenix Grace (Delmar), Marie + Manny Greco (Catskill), Tyson Hauf (Preston Hollow), Michelle Hughes (Hudson), Tracy Huling and the Prison Public Memory Project (Pontiac, IL), Lee Jamison (Stuyvesant), JazzontheTube.com (Tivoli), JD (Round Top), Jeff at Big Tree Records , Jeff Bailey Gallery (New York), Jess (Catskill), Joseph (Chatham Center), Joseph (Delmar), Juuustuuz , Sara Kendall (Hudson), Pete Kirchoff (South Egremont, MA), Meredith Kooi (Atlanta, GA), Kristen (Hudson), Rose Kue , Pamela Kungle (Hudson), Kelly Kynion (Claverack), Leigh (Stuyvesant), Matthew Leinung (Menands), Lenox Local (Lenox, MA), Lievense Family Foundation (Tupper Lake), Linda and Claudia (Hudson), Elizabeth LoGiudice & Ross Burnell (Greene County), MaryEllen Madison (Philmont), Bill Mancini and Bernadette Powis (Kinderhook), Marc (New York), Margaret (Greenville), Maria (Hudson), John Mason and Susan Davies (Chatham), Valerie McAviney (Leeds), Jim McCabe (New York), Alanna Medlock (Saugerties), Kathy and Dennis Meehan (Cairo), Peter Meyer , Michael (Seattle, WA), Michael and Lisa (Claverack), Lawrence Moss (New York), Justin Nobel (Hudson), Jennifer Nunno , Aidan O'Connor (Greene County), Jan Perlin (Oak Hill), Carolyn and Mark Plakias (Kinderhook), Paul and Katja Rehm (Greenville), Gunnel Reznikoff (Chatham), Amy Rigby (Catskill), Christiana and Kieran Riley (Dutchess County), Rob (Ghent), Marty Rosenbaum (Albany), Ruby's Hotel and Restaurant (Freehold), Rundy (Hudson), Christy Rupp (Saugerties), David Salzberg (Kinderhook), Debra Samuels (Catskill), Richard Sandler (Catskill), Jane Scarpellino (New Haven, CT), Jack Schoonover (Los Angeles, CA), Andy Schwartz (New York), Phyllis Segura (Saugerties), Jack Sencabaugh (Catskill), John Shadley (Cairo), Elaine Shimono (Hudson), Brenda Shufelt (Mellenville), Fernando Silva (Brooklyn), Tom Skarimbas (Cairo), Alan Skerrett (Philmont), Melinda Slover (Hudson), Laura and Stu Summer (Hillsdale), SVB (Hudson), Sylvia (Hudson), Tara Fracalossi and Thomas Lail (Valatie), Mathew Tombers (Claverack), Robert Tomlinson (Catskill), Gaku Tsutaja (Elmhurst), Becca Van K (Freehold), Harry Vincent (Catskill), Michael Waldholz (Hudson), Kaya Weidman (Germantown), Jo-Anne Williams, Butch Young (Sherman Oaks, CA), Anonymous + (Albany), Anonymous (Averill Park), Anonymous (Brentwood, MD), Anonymous + (Brooklyn), Anonymous (Callicoon Center), Anonymous + (Catskill), Anonymous + (Chatham), Anonymous (Cornwallville), Anonymous (Craryville), Anonymous (Durham), Anonymous + (East Chatham), Anonymous + (Ghent), Anonymous (Glendale, CA), Anonymous (Great Barrington, MA), Anonymous (Greenville), Anonymous (Harwich, MA), Anonymous (Hillsdale), Anonymous (Holiday, FL), Anonymous + (Hudson), Anonymous (Hyannis, MA), Anonymous + (Kinderhook), Anonymous + (Lexington), Anonymous (Los Angeles, CA), Anonymous (Menands), Anonymous (Midland Park, NJ), Anonymous (Milan), Anonymous (Millbrook), Anonymous (Mountainville), Anonymous + (New York), Anonymous (Queens), Anonymous (Saugerties), Anonymous + (Stuyvesant), Anonymous + (Tillson), Anonymous (Tivoli), Anonymous + (Westerlo), and Anonymous (Woodstock). Andrew	Barwick	(Brooklyn), Katherine Bauer	(Hudson), Alex Benson (Tivoli), Audrey Berman (Germantown), Bridge Street Theatre	(Catskill), Elizabeth	Cortell	(Sherman Oaks, CA), Leigh	Cummings	(Stuyvesant), Jeffrey	Economy	(Saugerties), Tara	Fracalossi and Thomas Lail	(Valatie), Peter	Frank	(Hudson), Philip	Grant	(Nassau), Galen Joseph-Hunter	(Acra), Dave	King and Frank Tartaglione	(Philmont), Ula	Kulpa, Kathryn A	Laity	(Hudson), Lenox Local	(Lenox, MA), Karen Locker	(Kingston), Judd	Maltin	(Hillsdale), James	McCabe	(Claverack), Jess Puglisi (Catskill), Gunnel	Reznikoff	(Chatham), Tom	Roe	(Acra), Sheena	Salvino	(Catskill), Wendy	Schmalz, Sam	Sebren	(Athens), Lynn	Sloneker	(Hudson), Joanna	Tipple	(Ghent), Mathew	Tombers	(Martha's Vineyard, MA), Neva	Wartell	(Catskill), Anonymous	(Catskill +), Anonymous	(Chatham + ), Anonymous	(Chicago, IL), Anonymous	(Craryville), Anonymous	(Elizaville), Anonymous	(Hudson + ), Anonymous	(Jersey City, NJ), Anonymous	(New York), Anonymous	(South Cairo), and Anonymous	(Stuyvesant). Become a sustaining supporter by investing in community radio every month. Choose your monthly donation amount from the drop-down menu, and sign-up with a credit card or PayPal. You can cancel at any time. May we acknowledge you by name? Click "donate" to make a one-time donation by credit card or PayPal.